Eastern Shore Porch and Patio offers a wide variety of accessories for your new vinyl fence or vinyl railing. From a huge selection of caps that range from traditional, to low-voltage, to solar lights, we have countless accents available. If you do not see the product that you are interested in listed here, please reach out to see our full accessories catalog. Every one of our vinyl fencing accessories comes with a lifetime guarantee and the incomparable customer service that makes Eastern Shore Porch and Patio a household name. Solar lights are a practical way to top vinyl fence posts. They require no unattractive wiring or maintenance, and they will light the way to your screen room or your front door at night. Eastern Shore Vinyl Products offers quality structural posts made in our own fabrication facility and customized to your needs. Our structural posts are reinforced with aluminum and virtually maintenance-free, so you can use them to support your porch or patio with confidence. To complement our quality vinyl fence products, we offer our vinyl post trim rings for sale. Vinyl trim rings have a beautiful, neat appearance, are low maintenance, and outlive their wood counterparts. Our trim rings are available in several colors to match the rest of your vinyl railing. Eastern Shore Vinyl Product’s vinyl post caps are designed to integrate seamlessly with our high-quality vinyl fencing and vinyl railing. Our post caps can be purchased in numerous styles, designs, and colors to match the architecture of your home and your landscaping. 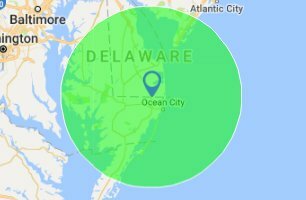 Eastern Shore Porch & Patio is proud to be the premier vinyl fence sales, vinyl fence installation, and vinyl accessories company for the Bethany Beach, Fenwick, Lewes, and Delmarva areas.